Karl Blossfeldt’s photographs have come to be seen as typical of the modernist era. 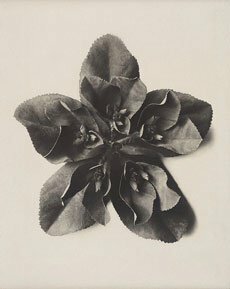 The focus of this selection of works from the Gallery’s collection is Blossfeldt’s Euphorbia helioscopia, Sun spurge, 5 x enl 1915-25. It can be said that the approach of Blossfeldt, and others working at this time, was structured yet egalitarian. This greatly influenced many later photographers – for instance, Bernd and Hilla Becher. In turn, the Bechers’ collaborative projects since the 1960s have inspired many younger artists including Idris Khan, whose three-part work is hung alongside a selection of other contemporary photographs, revealing the continuing influence of new objectivity into the 21st century.